One of my favorite shirts on Dean - this shirt is a nice marine blue with blue buttons, and two breast pockets that do up with flaps and buttons. In S6, Dean has a shirt identical to this one, but with slightly shinier buttons. I'm counting it as the same shirt for convenience sake, because it's really hard to tell the difference. In Wendigo (1x02), Dean wears the marine blue shirt for the entire episode. In Dead In The Water (1x03), Dean is wearing it when he arrives at Lake Manitoc, and while questioning the dead girl’s family and the Sheriff. In Phantom Traveler (1x04), Dean wears it when they go to talk to Jerry at the airport. In Bloody Mary (1x05), Dean is wearing it upon arrival at the Toledo morgue in the beginning of the episode. He wears it to the funeral of the victim and while researching (as Sam naps). In Bugs (1x08), Dean wears it for the whole episode except the goodbye scene at the end. In Faith (1x12), Dean is wearing it when he is electrocuted. 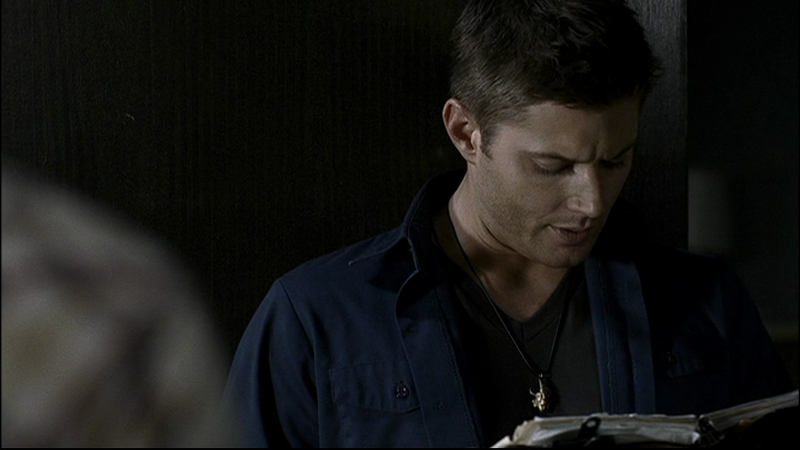 In Provenance (1x19), Dean is wearing it when he announces that he lost his wallet somewhere at the auction house. He then keeps it on until after they find the old woman dead in her house. In Everybody Loves a Clown (2x02), Dean is wearing it when he and Sam check back with Ash at the Roadhouse at the end of the episode – and Dean turns Jo down. In Children Shouldn’t Play With Dead Things (2x04), Dean wears it from the beginning of the episode until after he checks out Angela Mason’s apartment and runs into her roommate – when he gets back to the hotel (and catches Sam watching Casa Erotica) we see him change out of it. In Croatoan (2x09), Dean is wearing it at the end of the episode when he starts to tell Sam what John told him before he died. Therefore, Dean is also wearing it at the beginning of Hunted (2x10), when the conversation concludes. In Playthings (2x11), Dean wears it at the beginning of the episode when he arrives with coffee and Sam tells him about the possible job at the inn. In Roadkill (2x16), Dean wear it from when they first meet Molly until the end of the episode. 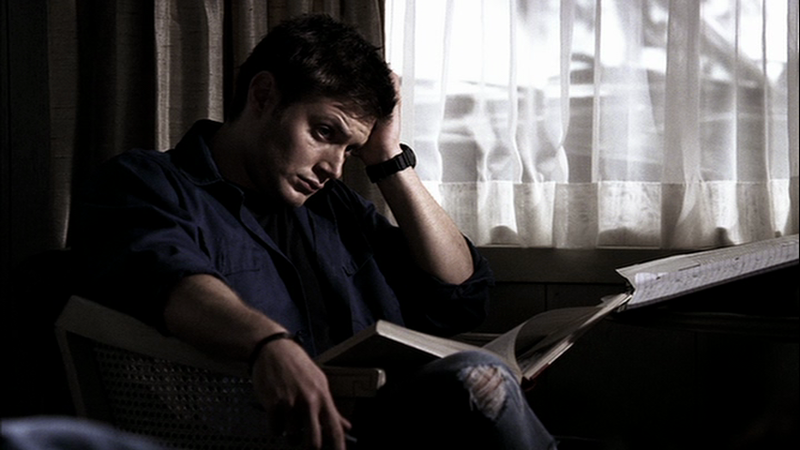 In Bad Day At Black Rock (3x03), Dean wears it for the entire episode. In A Very Supernatural Christmas (3x08), Dean is wearing it when he arrives at the motel and Sam puts forth the idea of Evil Santa. He leaves it on for when he and Sam check out the ramshackle Christmas market and confront the decidedly not evil drunken Santa. In When The Levee Breaks (4x21), Dean wears it the morning after he talks to Castiel until Sam escapes. Also, Dean wears it for the entirety of Sympathy for the Devil (5x01). In Changing Channels (5x08), Dean wears it when he is hanging out in the motel room after their interview with the victim’s wife. He keeps it on when they go to hunt the Trickster, but is changed out of it by force when thrust into “TV Land.” He is once again wearing it when he and Sam believe that they’ve successfully killed the Trickster and released themselves. He then changes out of it, before realizing that things are not what they seem. In Abandon All Hope (5x10), this may be the shirt Dean wears while they are in Carthage hunting Lucifer. In Two Minutes to Midnight (5x21), this may be the shirt that Dean wears from the beginning of the episode until after they get Pestilences ring. In Exile On Main St. (6x01), Dean wears it when he makes breakfast and goes to work during the opening montage of his life with Lisa. In Two and a Half Men (6x04), Dean wears this the morning he is teaching Lisa how to use a gun and then going to meet Sam to help with the hunt. He leaves it on for the rest of the hunt. He changes out of it after the hunt and is therefore not wearing it at the end of the episode when he and Lisa talk. In Caged Heat (6x09), Dean wears this shirt for the entire episode. In Like a Virgin (6x11), Dean is wearing this shirt from the beginning of the episode until after Sam wakes up and Dean and Bobby have their talk in the garage. In The French Mistake (6x15), Dean wears this shirt for the entire episode. In My Heart Will Go On (6x17), Dean wears this shirt when the boys try to save the lawyer Russo from getting killed by Fate. He wears it for the rest of the episode. In Mommy Dearest (6x19), Dean wears this shirt for the entire episode. It looks nearly black during the scenes at Bobby’s house though. In Let It Bleed (6x21), Dean wears this shirt for the entire episode. In The Man Who Knew Too Much (6x22), Dean wears this shirt for the entire episode (for the second episode in a row). In Meet the New Boss (7x01), Dean is still wearing this shirt in the continuation of the scene in Crowley’s lab. Then, the next time we see him back at Bobby’s house working on the car, he is surprisingly still wearing it! (Or I hope, wearing it again after it’s been through the wash, since this makes the third episode in a row that he’s worn it). Dean wears it until after he talks to Sam for the first time since Sam’s collapse at the lab. We then see him wear it again a few days later (presumably) while he works on the Impala with Sam and they listen to the radio and hear about Cas killing motivational speakers. Again, later on, he wears it again when Crowley delivers the spell and then they go call Death. He does not wear it again after they finish the meeting with Death. In Shut-Up, Dr. Phil (7x05), Dean wears this shirt from when Sam comes back to the motel with the chicken feet until the end of the episode. In Slash Fiction (7x06), this is possibly the shirt that leviathan pretending to be Dean wears. In How To Win Friends and Influence Monsters (7x09), Dean wears this shirt from when he, Sam, and Bobby start hunting the monster in the woods until the end of the episode. In Death’s Door (7x10), Dean is, of course, still wearing this shirt as they bring Bobby to the hospital. He wears it for the entire episode. In Adventures in Babysitting (7x11), Dean wears this shirt during the first and second week after Bobby’s death. In The Slice Girls (7x13), Dean wears this shirt from when they start researching Amazons using Bobby’s books until the end of the episode. In The Born-Again Identity (7x17), Dean wears this shirt at the beginning of the episode when he talks to Sam’s doctor and visits Sam at the hospital. In Trial and Error (8x14), Dean wears this shirt when he and Sam travel to the Cassity farm and get jobs there in order to find and kill a hellhound. He wears it for the remainder of the episode. It makes his eyes look more blue than green. If you only ever saw him wearing this shirt you might think he has blue eyes. There's a small error. The episode 'Faith' is 1x12 not 1x11. Thanks for taking the time to put this together though. This is awesome! Oh I like this one! He has had it for so long? Wow. Is it full cotton or one of those 65% polyester stuff? I don't know. I don't own it. I can only see it on TV though. I don't have access to the shirt IRL. So, you'd have to google Dickie's shirts to find out, probably. That's the brand that makes it. I don't know if they make all their shirts the same or not though. Thank you very much for all of your work on this stuff though. I just made an account and wanted to tell you that I appreciate it. I know it's for sure time consuming. Yeah, it's because I use the DVDs to take the screencaps that I need, so I have to wait for the DVDs to come out every year. It means that I'm usually a season behind. The only thing I've (momentarily) given up on is listing the clothes by episode - because that's really time-consuming stuff. I might try to do it again in the future, but for now it's enough to just keep up with the season lists. Okay, I just checked with a friend who owns this kind of shirt, and it's 65% polyester, 35% cotton. All the information I have is on the page, so if it's not listed up there, then I don't know it. Sorry! Best of luck! Do you know the RN of that shirt? No. If it's not in the post, then I don't know it.